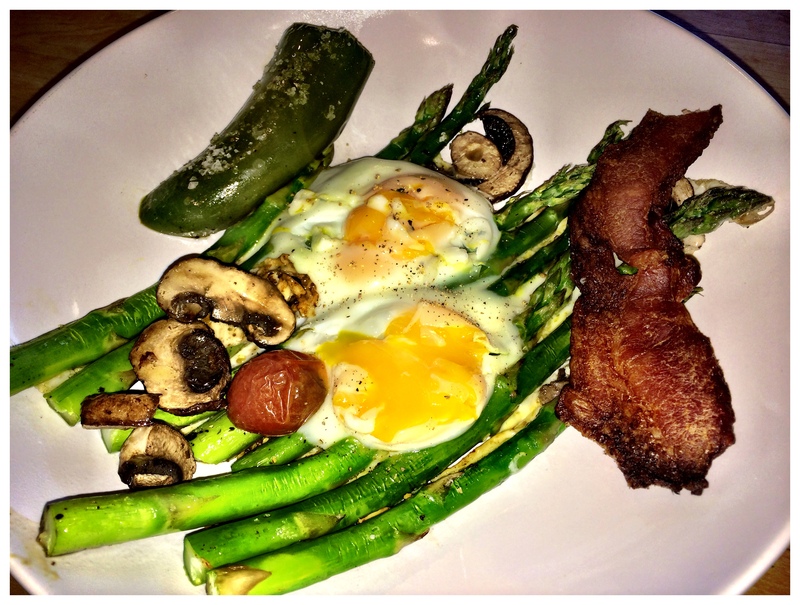 Ever “Baked” Bacon & Eggs?? Preheat oven to 450 degrees. 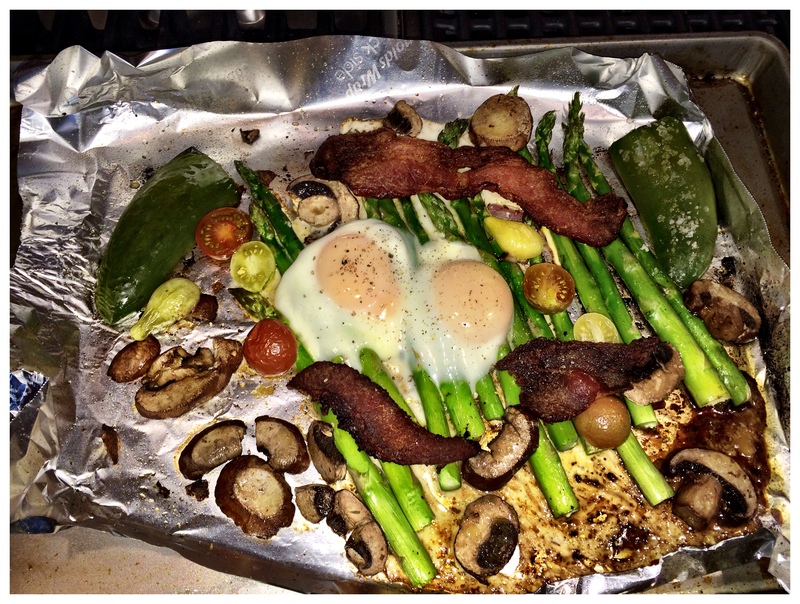 Place the strips of bacon on a foil lined sheet pan and place in oven. Mine were thick, large pieces so they took a little longer to cook, about 12 minutes. But keep a real close eye those strips. They go from uncooked to cooked pretty fast. Once the bacon is the way you like it, remove it from the oven. Drain the grease from the pan (leave a coating for flavor). Add the veggies onto the same pan and toss them around to coat them with the oil. If you removed most of the oil you’ll need to add a little olive oil. Lightly salt and pepper and put the veggies in the oven. Keep a close eye on them. I cooked mine for about 5 minutes but essentially you want them not quite cooked. When they are still a bit crispy remove the pan and crack the eggs over the vegetables and then they go back in the oven. I cooked the eggs for about 4-5 minutes. It depends how you like them. I like the whites cooked and the yolks runny. 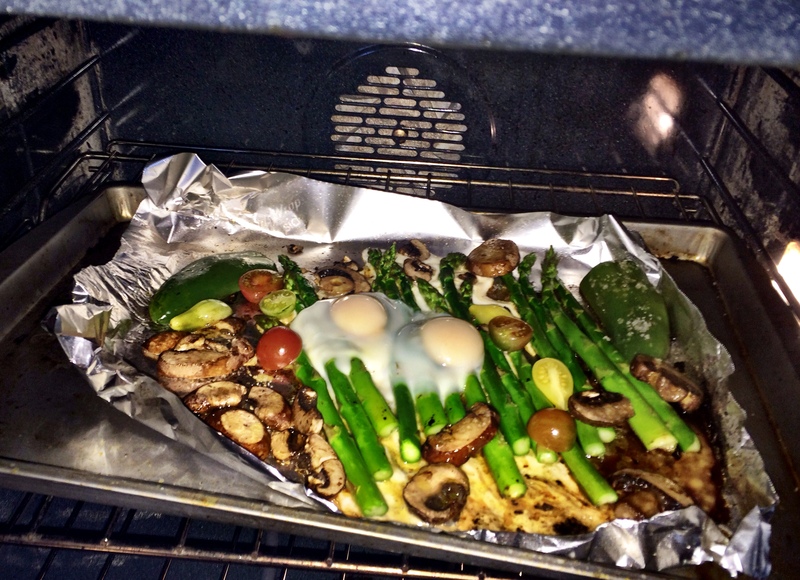 When the eggs are done remove the pan from the oven and add the bacon to the whole lot of it. Plate and serve! I have to say, baked eggs have a very different, luscious texture vs when you cook them in an “ordinary” pan. And the bacon for some odd reason is not greasy. I hope you’ll try it and if you do let me know what you think! Categories: Travel into My Kitchen! 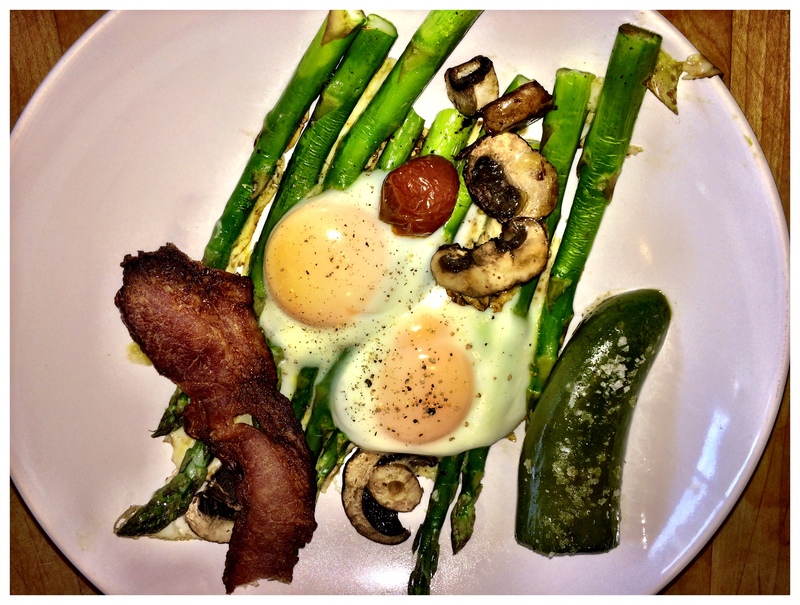 | Tags: asparagus, Bacon, baked bacon, baked eggs, breakfast, comfort food, cooking, cozy, eggs, food, gourmet, jalapeno, mushrooms, tomatoes | Permalink.